A blaa is a soft, doughy white roll – with either a soft or crusty top. It has a chewy texture that makes it a perfect vehicle for butter. 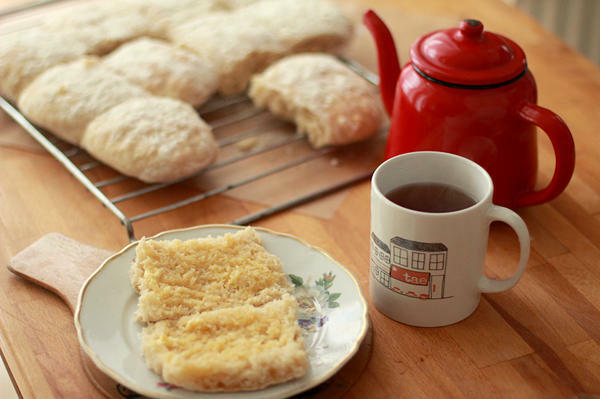 Only the ones baked in Waterford, Ireland, can officially be called "blaa," but you can try out the recipe below at home. 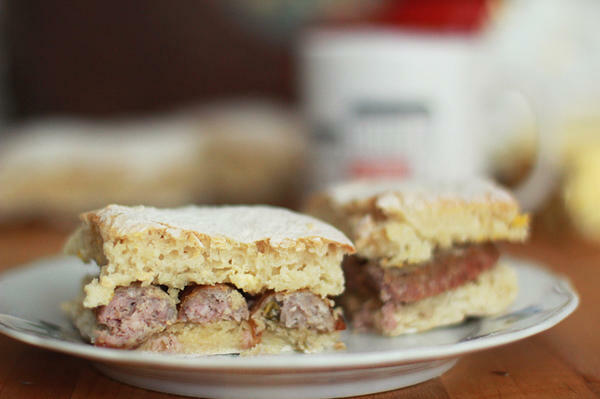 Fillings like this sausage are typically added after the blaa is taken out of the oven — as soon as possible! Want to mark this St. Patrick's Day with something beyond the usual corned beef and cabbage (which aren't so traditionally Irish anyway)? Why not mix up your menu with a tasty tray of blaas? Not blaa as in boring. Blaa is actually the name of a treasured bread from the town of Waterford, Ireland, where up to 12,000 fresh blaas are eaten daily. This soft, doughy white roll — with either a soft or crusty top — has a chewy texture that makes it a perfect vehicle for butter. Be assured, the blaa isn't any old bread: The European Union considered it special enough to award it "Protected Geographical Indication" status in 2013. That means only rolls baked in Waterford can bear the name "blaa," in the same way that only bubbly from Champagne can bear that region's name. This delicacy is a bit of an endangered species. Only four bakeries in Waterford produce the official blaa: Walsh's, Kilmacow Bakery, Barron's and Hickey's. "Each of the four bakeries make blaas in a slightly different way," explains third-generation baker Brian Hickey, whose family bakery has been selling blaas for more than 50 years. And each bakery commands fierce allegiance. Hickey says Waterford residents "rarely drift from one bakery to another — a bit like following football teams. You could get into a row with your neighbor over who makes a better blaa!" What distinguishes the blaa from your average roll is an abundant use of flour throughout the baking process. After the first and second rise, the dough is turned out onto a flour surface. Personally, I flour the dough generously in order to easily handle it while shaping the 24 blaa buns. The blaas receive another sifting of flour when they are left to rise in their bun shapes, and floured once more before hitting the oven. The plentiful flouring at each of these stages gives the blaa a distinctive floury finish — and also serves as a protection during baking. Fillings are typically added after the blaa is taken out of the oven — as soon as possible! The good news for the clumsy baker is that blaas are not typically uniform in shape and size. While the recipe for the blaa is quite simple, the key ingredient is patience: Blaa dough is left to rise for a total of up to 4 1/2 hours. Is it really blaa if you eat it outside of Waterford? That's a crumb of contention. Some of the Waterford bakeries distribute their frozen blaas internationally, but Hickey's bakery will sell only to local stores. Because there are no preservatives added to the blaa, it's ideally eaten on the day it is baked. Martin Dwyer, a consultant chef who previously ran a restaurant in Waterford and now runs a B&B in France, remembers the reverence with which his former co-workers in Waterford approached the morning blaa break at half-past 10. "A trusted member of staff would be sent to the bakery for the blaas — not a moment sooner, or they might be given blaas from the first baking rather than the second bake," Dwyer says. "These, after two hours, were deemed 'stale.' Then there would be the various personal preferences: well done, soft, floury or not too brown," he recalls. "They were eaten then mainly just with lots of salted Irish butter." Biddy White Lennon, a founding member of the Irish Food Writers Guild and a former judge on the reality-television cooking show The Great Irish Bake Off, included the blaa in her Best of Irish Baking book. Biddy initially became a household name in Ireland as an actress — she remembers how blaas fueled her early career. "I fell in love with blaas in my acting days," she tells us via email. "Waterford's Theatre Royal was a first-class touring date. Blaas fresh from an artisan bakery — filled with crisp smoked bacon or fresh mackerel — was a popular breakfast treat." Born and raised in Ireland, Elizabeth Rushe is a writer and photographer now based in Berlin, where she hosts the Berlin Belly food podcast. 1. Dissolve yeast and sugar in warm water. 2. When the yeast is frothy and the sugar is dissolved, add to the flour with salt and remaining water. 3. Knead for five minutes until smooth and elastic. 4. Place dough into a large oiled bowl and covered with oiled cling wrap. Let it prove in a warm place until doubled in size (about 1 hour). 5. Knock it down and let it prove again in the same way for half an hour. 6. Knock down again gently and turn it out onto a clean floured board. 7. Divide dough into 24 even sized round, slightly flattened buns (approx 3 oz. each) and place on a lightly floured baking tray. Allow to rise at room temperature until double in size - 2 to 3 hours. 7. Heat oven to 425 Fahrenheit. Dust rolls lightly with all-purpose flour and bake for about 15 minutes, or until they sound hollow when tapped on the bottom. Ideally, rolls should not be too brown on top. From Biddy White Lennon's Best of Irish Baking, published by O'Brien Press. Reprinted by permission.